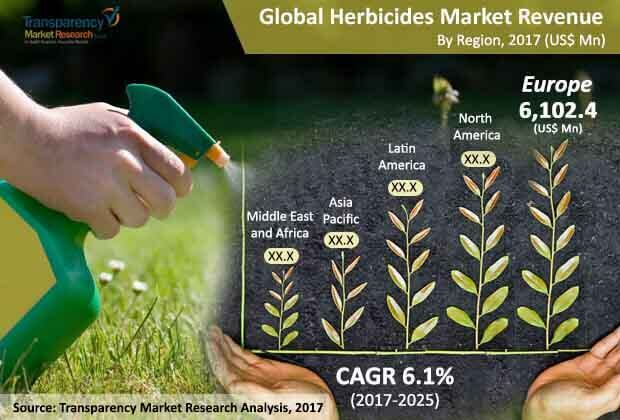 The global competitive landscape is increasingly consolidated as a whopping share of the global herbicides market is concentrated in the hands of a small number of players, notes Transparency Market Research (TMR). An upward of 75.0% share is owned by just seven companies, which include Syngenta International AG, DowDuPont Inc., Agrium Inc., Israel Chemicals Limited, Monsanto Company, and Bayer AG. Some other prominent players operating in the market are PL Industries, FMC Corporation, Nfarm Ltd., and Israel Chemicals. TMR finds that a large number of players are capitalizing on the synergies of mergers and alliances to consolidate their shares and bolster their product portfolio. The global herbicides market is anticipated to rise at a CAGR of 6.1% during 2017–2025 and touch a valuation of US$29.30 billion by 2025 end. The global valuation of the market in 2016 was pegged at US$17.37 billion. The various product types of herbicides comprise acetochlor, 2,4-D, glyphosate, and atrazine. Among the other segments, glyphosate led, vis-à-vis value as well as volume, in 2016. This is attributed to the vast demand for glyphosate-based herbicides as a type of non-selective herbicide useful in controlling a variety of weeds. The various regional markets for herbicides are North America, Europe, Latin America, the Middle East and Africa, and Asia Pacific. Of these, Europe led the global market in 2016 and is anticipated to retain its lead throughout the assessment timeline. However, Asia Pacific is forecast to rise at the most attractive CAGR over 2017–2025. Providing ample opportunities to local as well as global players, the region is expected to generate a revenue worth of US$4.0 billion by 2025 end. The considerable popularity that herbicides has garnered in the pesticide industry is on the account of their potential applications for controlling or destroying a wide spectrum of weeds and boost active growth of the desired plants. The ever-rising need of improving yield from the limited arable land available across the globe is increasingly intensifying the demand for effective weed-control phytotoxic chemicals. This is a prominent factor driving the demand for herbicides in the worldwide agriculture industry. The demand for weed control chemicals is especially accentuated by the rapid pace of infrastructural developments reducing the area of cultivable land available across the globe. The substantial demand for herbicide chemicals for the specific action on unwanted plants and continuous efforts in recent decades to improve their specificity are factors propelling the growth of the market. The reduction of manual and mechanical weeding in developing economies is also bolstering the uptake of herbicides among farmers. The market is accentuated by the rising demand for herbicides to be applied on cereals and grains with the aim to maximize crop yield. The role played by herbicides in improving the nutrition of plants and controlling soil erosion is also boosting their demand. However, the growth of the herbicides market is beset with several factors. The use of inorganic herbicides is plagued with the considerable risk they may have on environment. For instance, the adverse impact some herbicides have on the aquatic life and their undue exposure to workers may cause health problems. This has led to numerous regional regulations curbing the use of certain herbicides. The largely ban of glyphosate in parts of Europe is a case in point. Nevertheless, the advent of bio-based products has opened substantial lucrative avenues in the market. Furthermore, the relentless research on understanding the biochemical action of herbicides on plants has led to chemicals with better toxicity profile. The study presented here is based on a report by Transparency Market Research (TMR) titled “Herbicides Market (Product - Acetohlor, 2,4-D, Glyphosate, and Atrazine; Application - Oilseeds & Pulses, Cereals & Grains, Fruits & vegetables, Nurseries, and Turf) - Global Industry Analysis, Size, Share, Growth, Trends, and Forecast, 2017–2025”.